Referrals - Steckler Construction Inc.
We wanted to tell you that we have certainly appreciated working with all of you, some for many years. We have truly enjoyed every customer we have worked with over the years we have been in business. For those of you who were referred to us, you know what a comfort it is to do business with someone who comes to you by way of referral. Even if you were not referred to us by a friend, you probably called our references and gained the confidence you needed to know that we were a good match for you and your project. With the economy taking a bit of a breather, we have found that we are getting most of our new work from you, our previous customers as you have continued to mention us to your friends. We certainly do appreciate this and have decided to offer you an additional incentive for your continued support in building a “word of mouth” referral network for our business. We are offering to repay your kindness by offering you a cash or credit back based on the referrals you send our way. *Referral Bonus in the form of a 1% thank you cash OR as an alternative, if you are going to have a project coming up, we will issue you 2% credit toward your upcoming project with Steckler Construction, Inc. 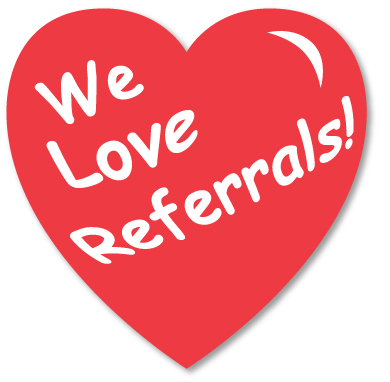 The way it works is to quality for the referral bonus you MUST COMPLETE THE FORM BELOW with as much detail as possible and will contact your referral and if it all works out we send you a credit for your upcoming services or a check for your help. The cash or credit value is based on the amount of the signed and completed contract with the folks you referred to us using the referral form below.